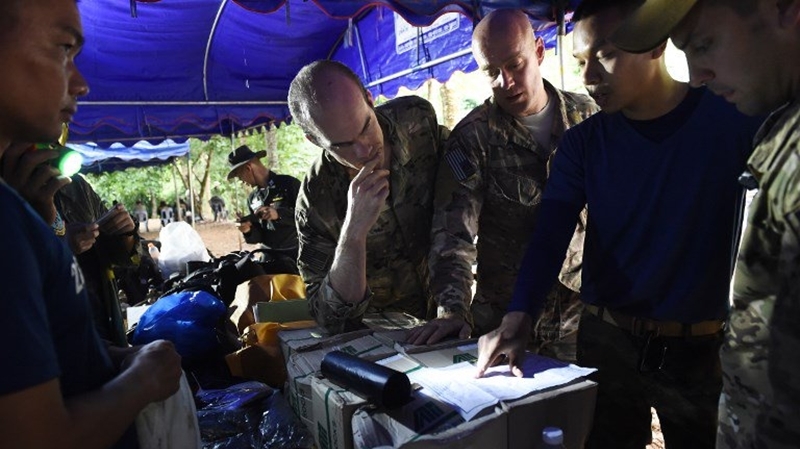 CHIANG RAI: A team of US military personnel and British divers joined rescue efforts at a flooded cave in northern Thailand where 12 children and their football coach have been trapped for five days as heavy overnight rains hampered the search. Flood waters seeped into a second chamber of the Tham Luang cave and forced some of the rescue divers to turn back, according to officials. The children, aged between 11 and 16, went into the cave last Saturday (June 3) and were trapped when heavy rains clogged the main entrance. Around 1,000 Navy SEAL divers, police, soldiers, border guards and officials have been mobilised for the around-the-clock rescue in a remote and mountainous part of Chiang Rai province near the Laos and Myanmar borders. “Operators are trained in personnel recovery tactics and techniques and procedures,” she said. Three British cave diving experts made a second attempt at entering the cave through chimneys today (June 28) after they tried to go in through the main entrance on the day before but were turned around by rushing flood waters. At nearly 10 kilometres, Tham Luang cave is one of the longest in Thailand and has the reputation of being one of the toughest, even among experienced divers. But fast-running and murky flood waters have prevented rescue divers from reaching them and heavy rains continue to seep into the cave through narrow openings on the sides and through the main entrance. “The water is like cafe latte, you can’t see anything, and there’s a very strong flow which doesn’t make it easy,” Ben Reymenants, owner of Blue Label Diving in Thailand, said from Chiang Rai where he was assisting with the search. High-pressure water pumps shipped in from Bangkok were set up but water levels continued to rise today. Officials said they planned to drill a hole into the cave tomorrow (June 29) and dispatched drones to find an ideal site for the hole. “It’s difficult to drill vertically, if you go up the mountain and drill there are high risks (of collapse) so we might drill from the the side to improve our chances of success,” Suttisak Soralump, a geotechnical expert from Kasetsart University said. “I’m sad. I want (my son) to be safe, we’ve heard nothing from officials yet,” Thinnakorn, the father of a 12-year-old in the cave, said. A government spokesman said Thai Prime Minister Prayut Chan-O-Cha would visit the site in the coming days. A forecaster in Chiang Mai said rains were expected to ease this afternoon and that visibility could improve as the fog lifts.